Cottage Delight unique Poppadom Chutney is made with 43% mango pieces and a secret, aromatic blend of spices including Nigella seeds. Sweet and fruity with a savoury undertone, Poppadom Chutney is perfect with all Indian cuisine. 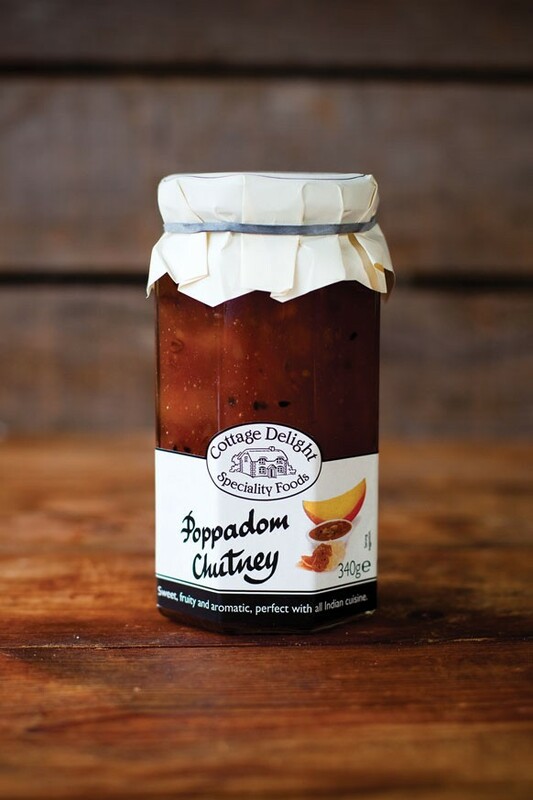 Serve Poppadom Chutney as a classic accompaniment to crisp poppadoms or why not try with Indian spiced lamb burgers or even grilled cheese sandwiches. Sweet, aromatic mango chutney, perfect with Indian cuisine with no artificial additives. INGREDIENTS: Sugar, mango (43%), sugarcane vinegar, salt, fenu-greek seed powder, citric acid, chilli powder, cumin, garlic, Nigella seeds, black pepper, cloves, green cardamoms, ground cinnamon, ground ginger.